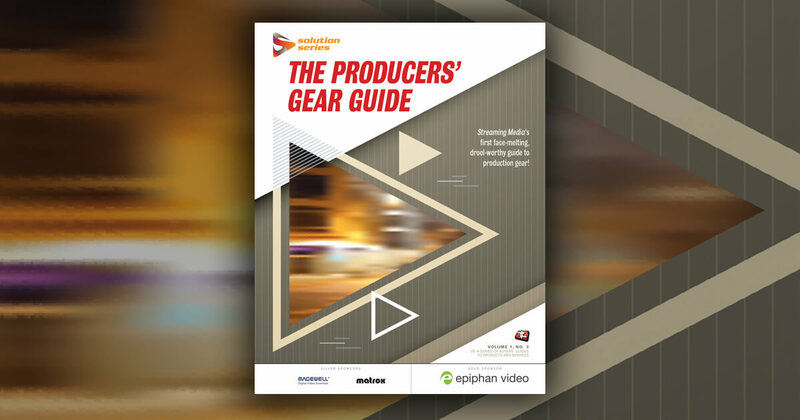 A new infographic, based on the results of a recent survey on large-scale webcasting, reveals a need for speed when it comes to buying webcasting services. 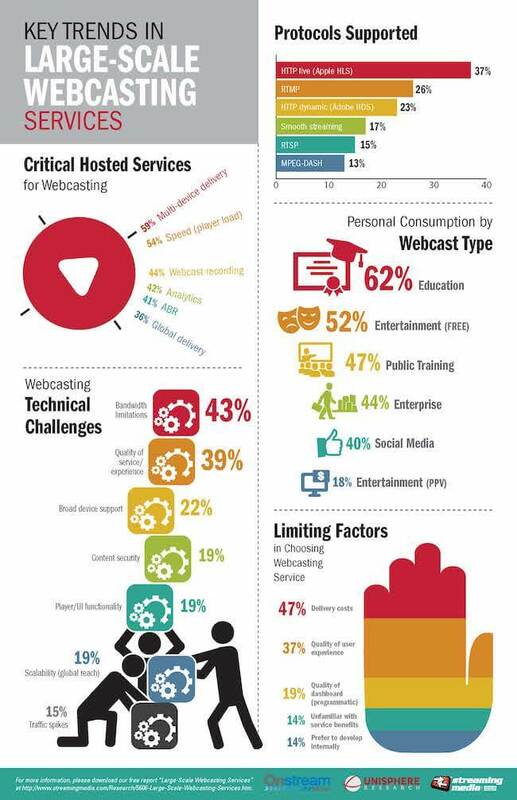 Published by Onstream and Unisphere Research—a division of Information Today, parent company of StreamingMedia.com—the infographic covers a number of key trends in large-scale webcasting services, including protocols, critical service requirements, limiting factors, and the types of webcasts consumed by our survey participants. The infographic, shown below (click here or on the image for the full-size PDF), highlights two areas that are of particular interest to large-scale webcasting customers, defined as those who buy webcasting services for their company or institution: player load times and adequate bandwidth. When it comes to critical services for webcasting, the speed of player load time is second only to the need for delivery to multiple devices, with 54% of respondents ranking player load times as their top requirement. Said another way, the importance of delivering to a particular device—which came it at 59% of responses—is critical, but a poor user experience on a particular device can limit the overall webcast’s effectiveness. Participants in the survey were also asked to rank technical challenges. Quality of service, or quality of experience, was listed as the second-biggest technical challenge, but the number one challenge was having enough bandwidth to deliver to hundreds or thousands of simultaneous live webcast viewers. Hosted services go a long way towards alleviating bandwidth concerns, although even a large-scale webcasting service provider can’t solve the last mile bandwidth issue. Yet it seems that our survey respondents were less concerned about the last mile and more concerned about the technical feasibility—as well as the financial, security, and venue transport issues—surrounding delivery to a large number of simultaneous webcast viewers. The financial implications of bandwidth also go hand-in-hand with the primary limiting factor in choosing a large-scale webcasting service: delivery costs. To address the ongoing concern that webcasting customers have regarding delivery costs, companies like Onstream have devised flat-rate pricing models. Some do so on an event basis, while others do so on a timeframe of one week or one month of flat-rate webcasting. A final area of interest on the infographic is protocol support. It’s no surprise that, even for live webcasts, Apple’s HTTP Live Streaming (HLS) is the dominant delivery protocol, since HLS can be delivered to desktop PCs and mobile devices at the same time. Yet the second-place protocol, Adobe’s venerable Real-Time Media Protocol (RMTP), holds its own, ranking high above Adobe’s HTTP Dynamic Streaming (HDS) as well as Microsoft’s Smooth Streaming and the more recent MPEG-DASH industry standard adaptive bitrate (ABR) protocol. RTMP continues to have “legs” when it comes to continued usage, perhaps due to the nature of real-time protocols that can be used to send a single high-quality stream to a media server, which can then repackage, transcode, and even transrate content for delivery to mobile devices reliant on HLS or another popular ABR protocol. The report covers survey results for high-volume, desktop-centric, fixed-price live webcasts, looking at mobile support, the type of media consumed, and more.